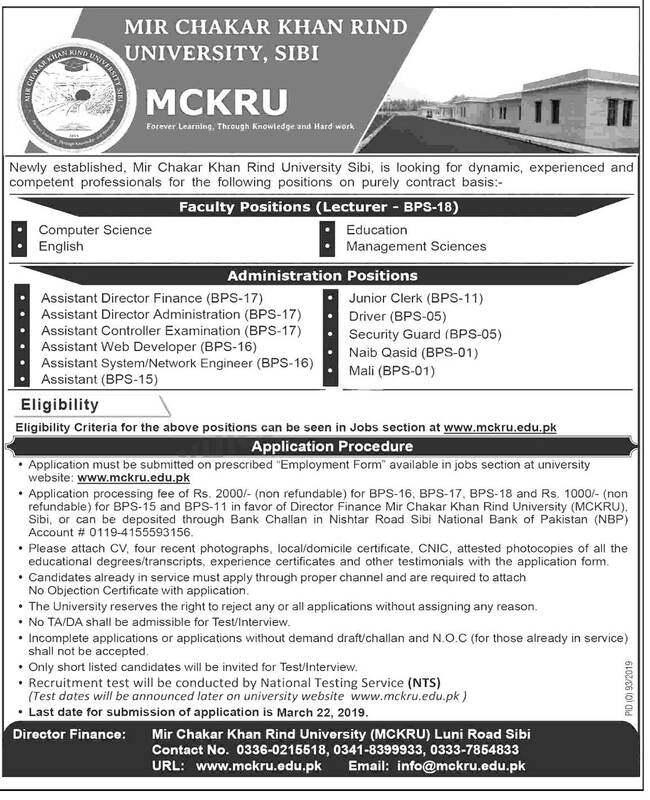 Mir Chakar Khan Rind Sibbi MCKRU University announced the Jobs 2019 for the various positions if your eligible and interested to get the jobs 2019 then you must apply for these jobs with in due dates because after the due dates application forms will not be accepted. Mir Chakar Khan Rind Sibbi MCKRU University assigned the National Testing service NTS to conduct the test on their behalf for these jobs 2019. So you must apply for the NTS Test. Once you will applied for the jobs to NTS then First of all NTS will display the Candidates lists and then send the roll number slips to the residential address of the candidate. Applications must be submitted along with all necessary documents on the prescribed “Application Form” with a Bank Draft of Rs:2000/- in favor of Director Finance Mir Chakar Khan Rind University (MCKRU) Sibi, or can be deposited through Bank Challan. Incomplete documents and applications after due date shall not be entertained. Both Male & Female candidates are eligible to apply. Age limit not more than 45 years of age at the time of closing date for the application (Maximum 45, no minimum age). Candidates who are already in service may apply through proper channel and submit NOC otherwise the applications will not be entertained and they are responsible for getting relieved properly from their parent departments. Challan Form Should Be paid in Nishtar Road Sibi. National Bank of Pakistan (NBP) Account # 0119-4155593156. Application form is available at is available here online. Duly filled applications along with four (04) recent passport size photographs, attested copies of all educational degrees, experience certificates, CNIC and Local/Domicile must be submitted to the office of the Director Finance Mir Chakar Khan Rind University (MCKRU), Luni Road Sibi on or before March 22, 2019. Duly filled applications along with four (04) recent passport size photographs, attested copies of all educational degrees, experience certificates, CNIC and Local/Domicile must be submitted to the office of the Director Finance Mir Chakar Khan Rind University (MCKRU), Luni Road Sibi on or before March 22, 2019. Applications must be submitted along with all necessary documents on the prescribed “Application Form” available at University Website: www.mckru.edu.pk with a Bank Draft of Rs.2000/- for BPS-16 & BPS-17 and Rs: 1000 for BPS-15 and BPS-11 in favor of Director Finance Mir Chakar Khan Rind University (MCKRU) Sibi, or can be deposited through Bank Challan in Nishtar Road Sibi. National Bank of Pakistan (NBP) Account # 0119-4155593156. Candidates having only Balochistan local/domiciles are eligible for administrative positions. Incomplete documents and applications after due date shall not be entertained. Both Male & Female candidates are eligible to apply. Candidates who are already in service may apply through proper channel and submit NOC otherwise their applications will not be entertained and they are responsible for getting relieved properly from their parent departments. Candidate applying for more than one post shall submit separate application complete in all respect with necessary documents. The University reserves the right to change number of posts, cancel advertised posts, not to fill any post, partly or as a whole. The university also reserves the right to withhold the appointment against any advertised post or to accept/reject any application without assigning any reason. Hiding facts and providing mis-information may lead to termination even after selection of candidate at any stage. Canvassing in any manner or form will disqualify the candidate. Maximum age limit shall be count till the closing date. General relaxation in upper age limit of Government of Balochistan shall be followed in all cases. Only shortlisted candidates will be called for test/interview and no TA/ DA will be admissible for appearing in the test/interview. The bench mark for qualifying written test shall be obtaining 50% marks. Obtaining highest marks in written test does not confer the right of selection however final selection shall be decided by the Selection Board. Last date for submission of application is March 22, 2019.